Your bill includes a 16-digit account number. Please have this number on hand when doing business with Memphis Light, Gas and Water. The account number is broken into two parts. The first nine digits are your customer number and will remain yours, even if you move away then back to the MLGW territory. The last seven digits are a premise number and are address specific. 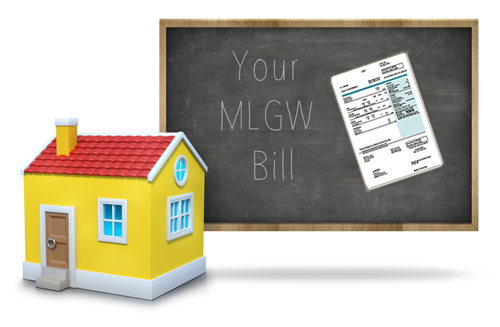 You will need the entire 16-digit number when doing business with MLGW. I don't have my account number with me. How can I get it? You can either call MLGW's Customer Care Center at (901) 544-6549 or e-mail your request to MLGWCustomerCare@mlgw.org. Please be prepared to provide additional information about your account and residence for verification purposes. Why are there charges for sewer, solid waste disposal and fire protection services? The inclusion of sewer, solid waste disposal and county fire protection fees on MLGW utility bills saves time and money for everyone. However, these services are provided by the City of Memphis and Shelby County, not MLGW. If you have a question about sanitation issues, call (901) 576-6730. For questions about sewer issues, call (901) 576-6757. For County Fire Protection issues, call (901) 385-5127. Click here for answers to frequently asked questions or to contact MLGW. Finally, how does MLGW apply its rates throughout the service area? In the case of residential gas and electric rates, they are absolutely identical everywhere in Shelby County. However, because of production and distribution costs, water rates are lower within the Memphis City Limits than in unincorporated areas of the county. Also, water rates in Bartlett, Collierville, Germantown and Millington are set separately by those municipalities, since they operate their own water service. Why do gas prices fluctuate so much? As a commodity traded on the open market, natural gas prices fluctuate based on the laws of supply and demand. And, when the nation's demand for gas is greater than the available supply, natural market forces drive up the prices that distributors such as MLGW must pay for natural gas. Your monthly gas bill reflects the cost of the natural gas MLGW purchases, as well as the cost of stor9ing, transporting and delivering that gas. These costs fluctuate due to the deregulated, competitive marketplace. Like virtually all natural gas utilities, MLGW uses a Purchased Gas Adjustment (PGA) to pass along these increases and decreases in gas costs to our customers. How and when did the PGA begin? The PGA is the result of natural gas deregulation and the fact that MLGW must operate within applicable legal guidelines. MLGW cannot sell utilities at a loss. When the natural gas industry deregulated in 1993, MLGW knew that its monthly gas costs would vary with prices in the gas market. To account for these variances, in 1993 the City Council approved MLGW's decision to develop and implement base gas rates with a purchased gas adjustment as a rider to add to or subtract from this base price as the monthly cost varies. How does the PGA appear on my bill? From November 1993 until April 2003, the PGA charges and the base rate charges were combined on your bill as a single charge. However, in May 2003 reformatted its bills and listed the two charges separately. This was an attempt to provide customers with additional information. However, based on feedback from customers and other stakeholders, MLGW has resumed presenting the PGA in the format that was used for the previous 10 years. The PGA cost per unit now appears on your bill, but the separate charge does not. The Tennessee Valley Authority, MLGW's electric supplier has implemented a Fuel Cost Adjustment (FCA) that began with the the October, 2006 billing cycle. Like all other TVA rates, MLGW must pass the FCA through to customers. The FCA appears on your bill as a line item under the electric section of your bill.